Wanna automate Mouse Clicks and Keyboard Actions or even to create shortcut keys or hotkeys to automate group of actions and do not worry about script or any type of programming ? In case yes this post talks about a AutoHotKey alternative which can do lots of windows automation without requiring any programming or scripting language understanding. The Software presented here provides User Interface to control almost every type of windows automation tools like clicking of mouse, typing something onto keyboard, automatic mouse drag drop or even opening of applications or documents. You can even add text to voice command or even message prompts to further enhance your script doing automatic input to your computer. 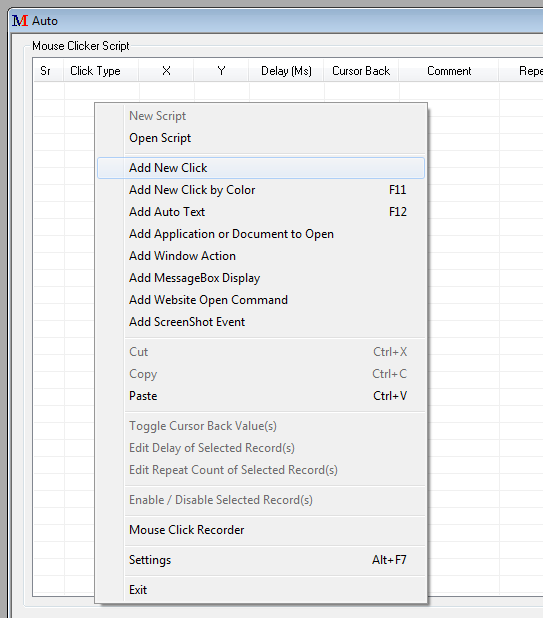 The figure above displays what all type of automatic actions you can add to the script and run it with a HotKey combination or with other options like desktop shortcuts, task scheduler, etc. AutoHotKey requires you to understand scripting language and can be difficult at times to automate simple tasks like pressing a key on keyboard multiple time at scheduled interval. The Software preseneted above is named as Auto Mouse Clicker although it can automate lots of other things as displayed above. Whether you are looking forward to create a auto key bot which can press a single key on keyboard multiple times and the typing of the selected key or long text sentence can be controlled using a configurable hotkey combination. All you would need to do is add an Auto Text, define the key or text sentence you would like to be automated, Assign a Shortcut or HotKey combination from the menu options provided and that’s it. Whenever you press the assigned HotKey combination or shortcut on you keyboard, the keyboard automation will get started as defined in the created script or macro. Unlike AutoHotKey, you would not need to learn programming or look for autohotkey examples or tutorials, the software has all the tutorials and examples built in and is really easy to use. The Software presented above works on Windows 8 which is the latest buzz on internet and even on old versions of Windows such as Windows 7, Windows Vista, Windows XP, Windows 2000 Server editions, etc. You will be able to automate almost every type of Mouse and Keyboard input to your computer. The Automation done will be as good as someone physically typing on keyboard and using the mouse and the application with focus will not understand whether the input provided is by a software or by a human. The Software can be used for various purposes apart from creating bots for games, scheduling repetitive tasks, automating mails or even working on internet.